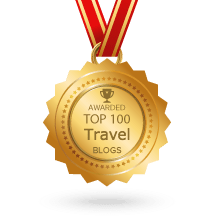 Though I love the outdoors, it’s difficult to avoid cities when you’re traveling to a destination abroad since that’s where you generally find the airports. Most of the time I’m in a hurry to leave these urban environments and find a sandy beach or a cool jungle. That being said, some cities are worth a few days of my precious travel time. One of these is Panama City’s “old quarter” Casco Viejo. 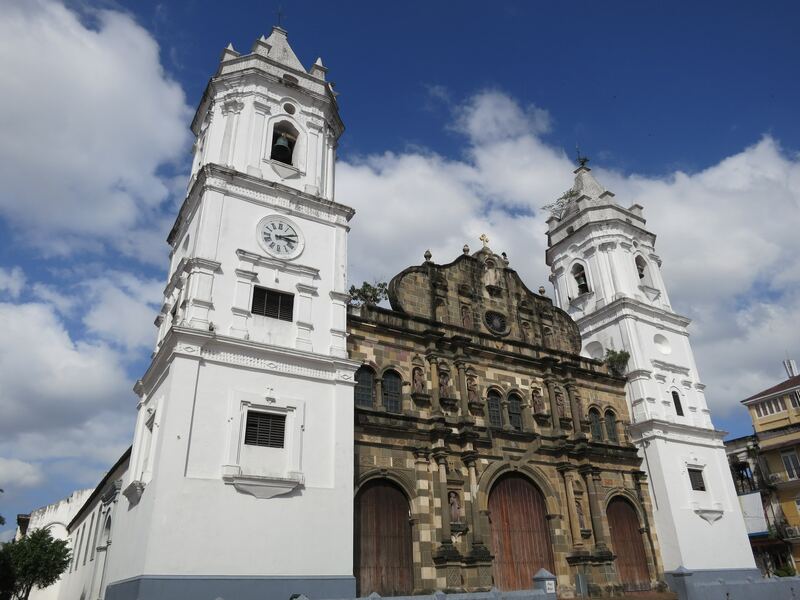 Founded in 1673, after the former capital Panama Viejo burnt down and was looted during a pirate attack, Casco Viejo was once the hub of Panamanian culture and civilization. Jutting out into the sea on a peninsula (a site chosen to guard against the next pirate assault) Casco was later abandoned when modern Panama City sprouted its skyscrapers across the bay. But after many years of neglect, Casco is experiencing a renaissance. In 1997 the UNESCO declared it a World Heritage site and gave financial incentives for restoration projects. And while the historic district is still somewhat of a work in progress, that’s exactly what makes it exciting. Walking the streets in this quarter is a schizophrenic experience: burned-out shells of old, dilapidated, cracked buildings inhabited by squatters stand side-by-side with chic new coffee houses, gourmet restaurants, boutique hotels, and some of Panama’s hottest clubs and bars. Thanks to UNESCO Casco Viejo did not undergo the typical “tear-down-the-old and build-something-new” approach that guts a place and robs its heart and soul. Instead, investors try to preserve the old architecture and feel of this barrio by restoring the existing buildings. This is far more eco-friendly than demolishing the buildings and placing all that toxic waste into a landfill. Not to mention the cost in energy and materials to build new. And while before the reconstruction, Casco was a place of gang wars and street violence, now it’s relatively safe. Just use common sense (don’t show valuables, don’t walk alone at night, etc.) and make sure you don’t wander too far west into the district of El Chorrillo, which still has drug and gang problems. Though most likely the Tourist Police will stop you anyway, as they patrol this area in large numbers. You can easily walk all of Casco in less than a day. But there’s so much to see and do here, you should spend a couple of days exploring the churches, palaces, plazas, restaurants, cafés, markets, and streets, and alleys. Stroll along Casco’s seawall on the Esteban Huertas Promenade under a blazing ruby-red Bougainvillea canopy and watch locals, tourists, and street vendors intermingle. From here you have a clear view of the stark contrast between the modern skyscrapers across the bay in downtown Panama City and historic Casco. Esteban Huertas Promenade is also the site of one of my favorite street markets (the other is the market at Plaza de la Independencia). 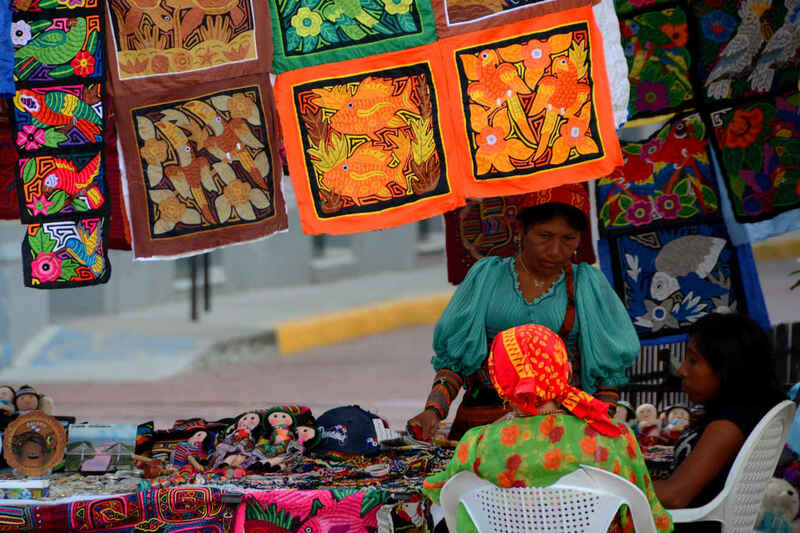 These markets sell souvenirs and handmade crafts, as well as jewelry, pearls and colorful, traditional tapestries called molas. Cruising the markets also offers you the chance to interact with indigenous people from all over the country that come here to sell their wares. Most of them are dressed in beautiful traditional clothing and trinkets, but make sure to ask for permission before you take a picture (easiest done if you buy a little something before). Casco Viejo has plenty of large open-air plazas where locals and tourists alike hang out, relax, and enjoy a coffee or beer. 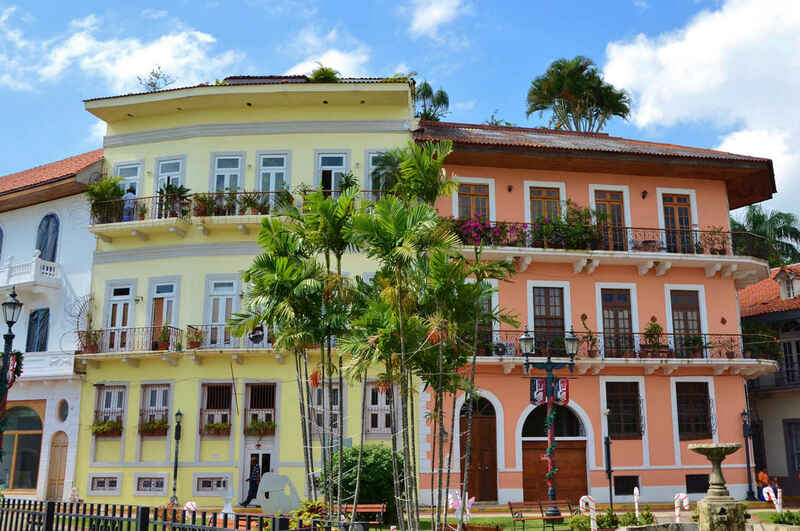 Check out Plaza Bolívar, which is surrounded by beautifully restored buildings from the 19th century. Plaza Herrera has a more local and rough feel. And directly in front of the Catedral Metropolitana in the very heart of this barrio is the popular Plaza de la Independencia (also called Plaza de la Catedral). Panama is a Catholic country, so you’ll find a lot of beautiful old churches here. Some are impressive from the outside (Catedral Metropolitana, San Francisco de Asis), others from the inside (San José), while others are beautiful both in and out (La Merced). And don’t forget to pay homage to what’s left of the Church of Santo Domingo which was destroyed by a fire in 1756. Casco Viejo’s old Palaces showcase the former glory of this district. Be sure to stroll past the majestic Palacio Nacional and Palacio Municipal, or tour the gigantic roofed inner courtyard at Palacio Bolivar. If you like to see where the President of Panama resides, visit Palacio de las Garzas with its beautiful patio and lavishly decorated rooms (you’ll need to arrange this free tour a few days in advance). A must do is the 100-year-old National Theater. I was lucky enough to sneak in while some workers were doing renovations and take some photos of the colorfully painted ceiling and gilded balconies. But next time I’ll go in the evening and enjoy one of the many music, dance, or theater events there. Casco has a wide variety of great dining options. You can go for a 10-course dinner at a swank farm-to-table restaurant, dine under the sky in old ruins, or grab a deep-fried chicken and yucca from one of the street vendors on Calle Pablo Arosemena. To see a selection of the best restaurants in Casco, visit our Restaurants in Panama page. Our favorites are Manolo Caracol, The Fish Market and Tantalo. If you like to party, Casco has a wide selection of great bars and clubs. My favorite hangout with a view is the rooftop bar at Tantalo. 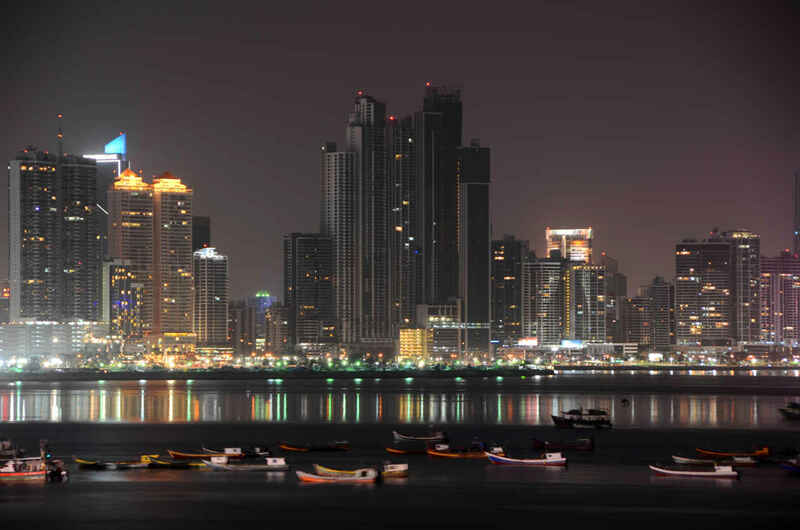 The place is hopping on the weekends, and you have a jaw-dropping view of Panama City’s skyline. Less scenic, but equally happening, is Mojitos Sin Mojito. Here, you can catch some great music and party the night away with locals, expats, and fellow tourists. If you are looking for a quick nature-fix to offset the urban landscape, it’s never far in Panama. A quick cab ride or short hike (5km/3mi) brings you to Ancon Hill—a wonderful little nature park that’s also a nesting place for toucans, so bring your binoculars. With a keen eye, or even a dull one (I almost stepped on a sleeping boa constrictor in Dominica recently, luckily Micha saved me) you can spot toucans, sloths, coatis, armadillos, tamarins, deer, and a large variety of orchids. In addition, Ancon offers incredible views of Casco Viejo, Panama City, the Bridge of the Americas, and the Canal. 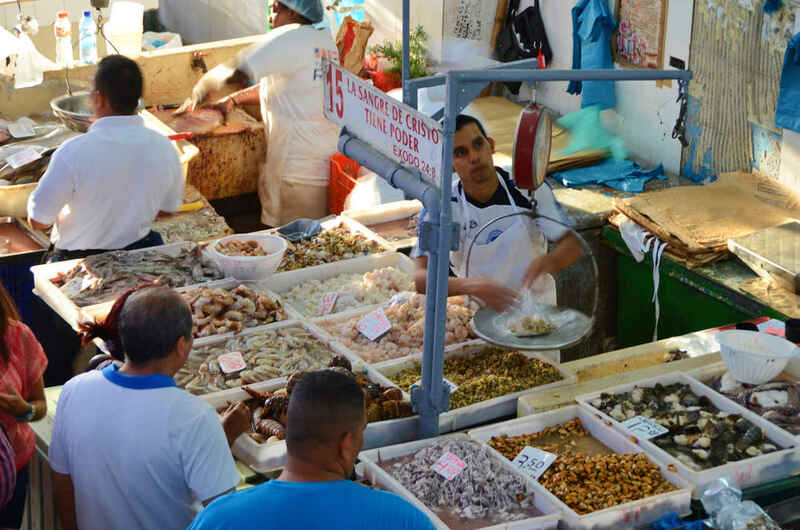 A short 10-minute walk from Casco you’ll find the fish market where you can wander the stalls and gaze in amazement at the bounty these fishermen haul out of the sea each day. You’ll find one of Panama’s specialties here, ceviche (sour lime-cooked fish chunks with lots of onion), which you have to try as it’s amazing! While my favorite tropical destinations are lush jungles, sun-kissed beaches and gushing waterfalls, cities are often a travel necessity. However, in rare occasions, as with Casco Viejo, they also add something to the adventure. Whether you’re looking for history, great food, impressive architecture, hip cafés, or a bumping night life, you’ll find it here. If I now got you excited about visiting Casco Viejo, you should book your next stay at Los Cuatro Tulipanes in the heart of the barrio. Its owner is involved in a great community project and it is an exceptional place to stay in this interesting historic district — with a special discount for our readers. Just send us a message indicating the nature of your inquiry (e.g., discount code Los Cuatro Tulipanes) and we’ll give you a discount code that you can use to save 5% on booking with Los Cuatro Tulipanes (min. stay 3 nights). 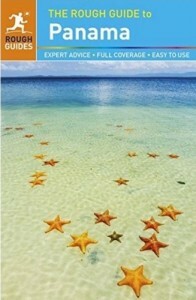 For a detailed map, more photos, and additional information on Panama, go to our Panama page. 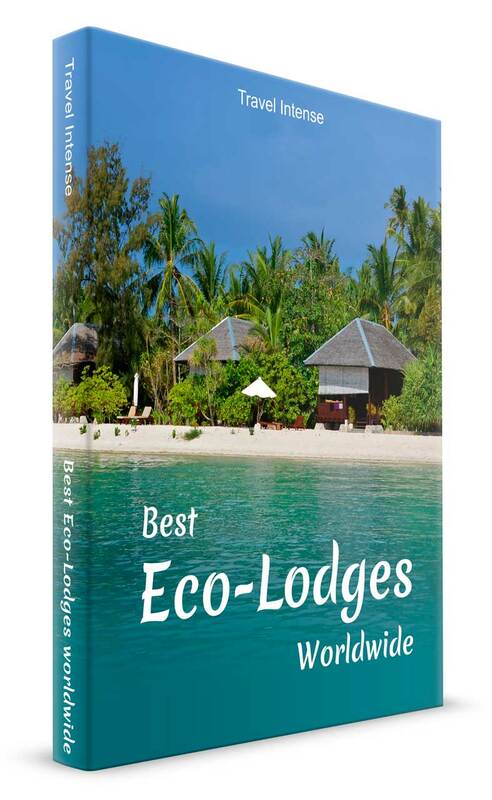 Or read our stories about the must-see Panama Canal and the island paradise of Bocas del Toro, where a stay at the amazing Al Natural Resort will make you never want to leave again. Promised! Now we want your tips: Which city has charmed you because of its history, culture, old architecture, etc.? Let us know in the comments below!